Natural resources encourage children to observe closely and use all their senses. Here are some practical ideas to bring them into early years learning. Providing an interesting and ever-changing environment for children to explore is an ideal way to develop their curiosity, provide opportunities for them to ask questions, and to talk about things they have discovered. Building up a collection of natural resources can begin with a selection of resources found in your immediate environment. Leaves, twigs and interesting stones can be found almost anywhere and make the ideal basis for a ‘naturals’ collection. These can then be supplemented with interesting and unusual items from other parts of the country, or further afield. rocks of different colours, shapes, sizes; pebbles and small smooth stones of different colours and shapes; samples of sand in varied colours and graininess. As with any other resources which you use in your setting, you will need to ensure that the natural materials you provide are safe to be used with young children. Be particularly careful if the children are at an age where they are likely to put the natural resources in their mouths. Add carefully selected natural materials, such as a large pine cone, a loofah, a large seed pod, shells and large polished stones to a Treasure Basket collection for young babies to explore. Use a choke tester to check that the resources you choose are large enough not to present a choking hazard. Natural materials are perfect resources for use in heuristic play sessions when children are developing their creative and critical thinking skills. 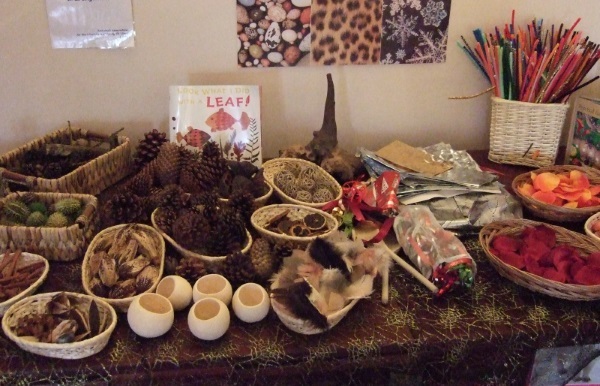 A selection of interesting cones, pods, dried whole fruits and wicker balls provides children with many opportunities to develop their conceptual understanding of big and little, same and different, long and short, few and many, heavy and light. Encourage children to pay closer attention to shades of colours by using paint sample cards from a DIY store. Ask the children to chose a colour card and then go outside and see if they can find any natural objects that match the shades on the colour card. Make a collection of sand collected from a range of different places. Help the children to notice the variations in colour and texture and provide magnifiers so that they can look more closely at the grains that make up the sand. Add natural materials such as twigs, straw, pebbles and moss to your range of small world play resources. Encourage the children to create small environments for dinosaurs, farm animals, wild animals or small characters. Natural materials can be used very creatively to produce designs and collages. All that is required is a selection of natural materials and an area in which to produce the design. This could be a tray, a plain coloured table mat, a flat mirror, a large piece of white paper or a sheet spread out on the ground. The important thing about this activity is that the resources are not glued down, so the designs are transient. Things can be moved around and changed and at the end of the session the resources can be packed away to use on another occasion. Photographs are an ideal way to retain a record of the creations the children have made. Add a range of natural building resources such as large stones, shells, small branches, off-cuts of wood and pieces of bark to the brick and block sets in the construction area. This will encourage the children to be more creative in their building and extend the range of problems they have to solve as they explore how to build with irregular shaped materials.